How often have you heard someone say about a particular food, “It’s an acquired taste”? If you cook with nutrition in mind or raise a diverse garden like me, I would bet it’s more often than not. That’s not an indictment of mine or your tastes, but if it is, I plead guilty. It’s more of an acknowledgment that we are on the right track when it comes to eating the healthiest things. Probably one of the most mentioned foods associated with “acquired taste” is kale. It’s an acquired taste, for sure, but kale is packed with vitamins and nutrients. Consider this: Kale has more iron than beef, more calcium than milk, 10 times more vitamin C than spinach. It also is good for your eyes, skin and bones, reduces the risk of heart disease and cancer and lowers cholesterol. We’ve become big fans of kale at our house. Therese and I have been raising kale in our garden for three or four years now. Each ensuing summer, we seem to be eating more and more, especially in our almost-daily dinner salad, in which kale is combined with leaf and iceberg lettuce as well as any number of vegetables including zucchini, cucumbers, bell peppers, onion and carrots. My favorite use of kale, however, is in soup. 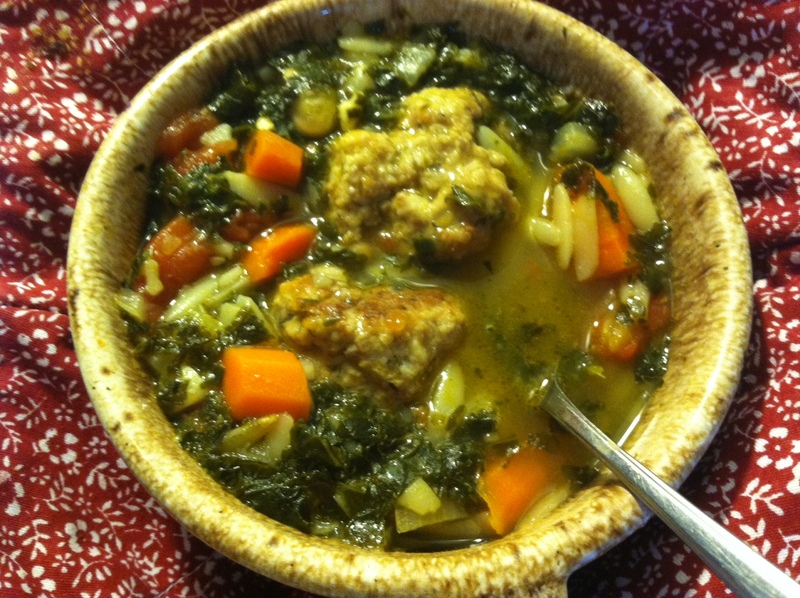 The following recipe, one that I created this past week, not only contains 4 cups of kale, it also is loaded with beans and carrots, two other highly nutritious foods. That’s the kind of recipe worth acquiring. Place all ingredients in a large bowl and mix thoroughly. Let stand ½ hour. Shape into medium-size meatballs. Fry gently in olive oil until lightly browned, or place on foil on a cookie sheet and bake for ½ hour at 350 degrees. In a large Dutch oven, add olive oil and heat over medium heat. Add the diced onion, carrots, celery and garlic. Saute until vegetables are softened, about 5 minutes. Add chicken stock and bay leaves and heat the broth to a boil. Reduce heat to simmer and add beans, tomatoes, kale, orzo, 10 to 12 meatballs and red pepper flakes (if using). Simmer for 10 minutes. Sprinkle with parmesan cheese and fresh basil, if desired. Serve with croutons to sprinkle on soup or crispy breadsticks on the side.